Following our report earlier this week that the Minister for Islamic Affairs and Chairman of the Baitulmal Fund had awarded a mega-building project to his own company, the opposition PKR party has reported Daud Abdul Rahman to the Malaysian Anti-Corruption Commission. 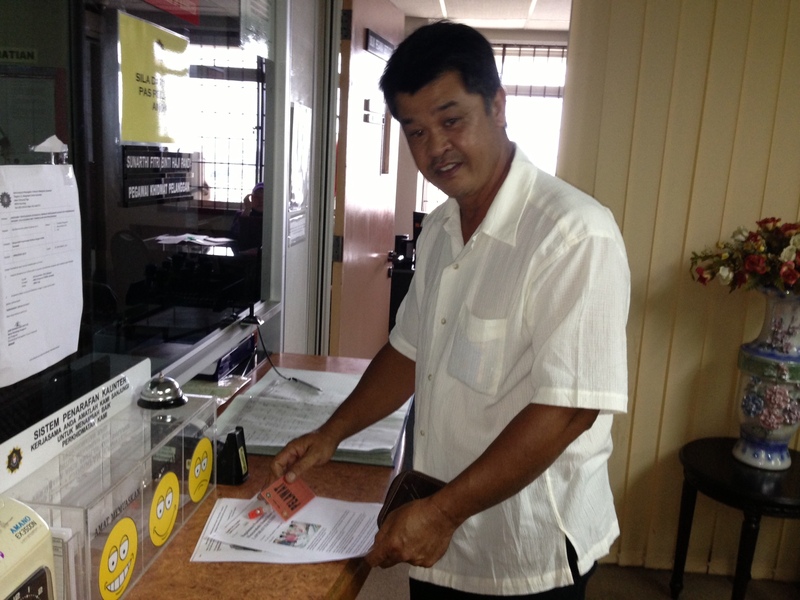 The opposition DAP party has also gone public to repeat its demands that the Tabang Baitulmal Sarawak, a statutory charity which is funded by obligatory donations exacted from Muslims, should make available its accounts. The row follows escalating concern over the phenomenal building spree that has been carried out by the Tabung Baitulmal Sarawak (TBS) at a time when some poor people say they have facedcutbacks in support. Many were unimpressed when Daud announced that a mere RM2million was being annually handed to the needy from the fund (which is meant for that purpose) while hundreds of millions are being spent on buildings in Kuching, Miri and Sibu. These latest developments follow the revelation by Sarawak Report that the next planned Baitulmal building, Baitul Makmur II in Petra Jaya, was commissioned from Daud’s own company Eastbourne Corporation for RM253million, before being sub-contracted to Hock Seng Lee four weeks later for RM228million. “TBS has its main source of revenue from the zakat paid by the Muslims. It is just like an alternative Inland Revenue Board, collecting tax from the public. “As such, it owes the public a duty to make full and frank disclosure of the management of its fund. 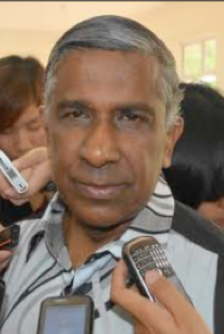 The zakat payers want to know how TBS used their zakat money and where their money goes,” stated Abdul Aziz, who is a special assistant to DAP leader Chong Chieng Jen. Meanwhile, a press statement issued by PKR’s Sarawak Woman Chief, Puan Nurhanim Mokhsen, announced that a party committee member for Petra Jaya (where Baitulmal II is scheduled to be built) had formally reported the matter to the MACC on Friday afternoon. “As a Muslim and contributor to the Baitulmal Funds, I feel very distressed on reading the article by internet news portal “Sarawak Report” . “We are .. very concerned with this issue as it affects the Malay/Muslim community and their obligatory contributions to the fund. We also note that there is this tendency of late for Badan Baitulmal to invest in properties and grand buildings…. “Baitulmal Funds are to be used for very specific purposes, particularly welfare for the poor and their education. I have personal knowledge of poor, and in my opinion deserving students being refused assistance, said Nurhanim Mokhsen. The statement from PKR re-enforced the demand by DAP for transparency in the management of the fund and demanded an immediate statement from Daud, who is also Minister for Infrastructure Development, to clarify his position in the light of Sarawak Report’s revelation that the board he chairs had awarded a mega-building project to his own company. Meanwhile, Sarawak Report would like to draw attention to a further contract for RM9.75million that was separately awarded to Daud’s private company Eastbourne. 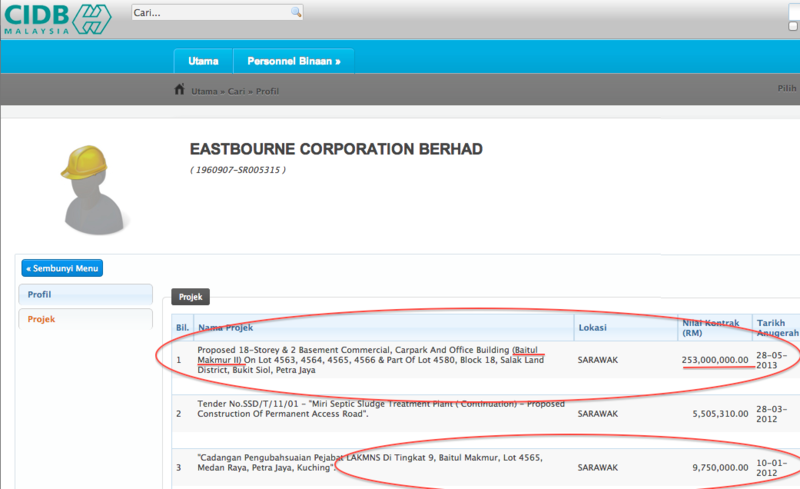 This additional contract is registered on the official Construction Industry Development Board (CIDB) website as having been awarded in January 2012, earlier than the main RM253million for the Baitulmal II building, yet it appears to relate to the same project. Since Daud Abdul Rahman is also the Minister for Infrastructure Development, it is worth noting that the CIDB website also records that well over three quarters of a billion ringgit of public contracts have been awarded to his company. Given his position of direct influence in the awarding of such contracts there are clear concerns over serious conflicts of interest and with so many questions now being asked, the Minister of Islamic Affairs and Infrastructure Development’s response is being eagerly awaited.